The most memorable images in The Wizard of Oz invariably involve color. The ruby red slippers. The yellow brick road. The Emerald City. Thank Technicolor, the motion picture process MGM championed in the 1939 film that brought those images vividly to the screen. The Wizard of Oz, in a way, served as a showcase for this relatively new technology. 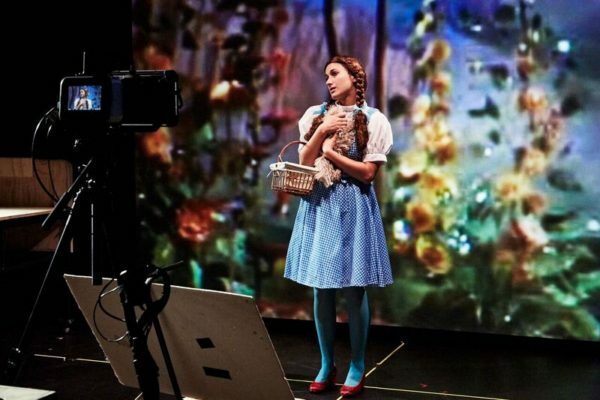 It’s fitting then, that The Builders Association’s modern, wildly inventive tribute to the film, Elements of Oz, works similarly to show off a whole new suite of 21st century technologies, including selfie sticks and iPads, YouTube videos and green screens. The crown jewel is an augmented reality smartphone app that adds an occasional extra layer of sights and sounds to what’s going on on stage. Most of that action in Elements of Oz is a live, abridged re-enactment of the film, carried out briskly and seamlessly by Moe Angelos, Sean Donovan, Hannah Heller and other members of the company. It’s an impressive theatrical feat, requiring a precise choreography of quick costume changes and rapid, one-time-only takes for a roving camera crew, whose shots are quickly spliced together and intermittently screened throughout the show. The technical challenge is further complicated with the addition of the app, which activates at select moments during the performance. Sometimes, the effect is simple audio: In Kansas, phones emit the clucks of chickens, while in Oz, they release the high-pitched giggles of Munchkinland residents. Other times, the experience is visual: The Wicked Witch unleashes her flying monkeys and, on our screens, we see them soar through the sky. Digital flowers sprout up out of the ground when Dorothy and her companions, on stage, race through a field of poppies. And in one of the most effective moments, precipitation falls from dark clouds as the actors create the twister that transports Dorothy to Oz. While the augmented reality bits are an amusing, if not always necessary, supplement, it’s not crucial to the enjoyment of the performance. Smartphone-less prospective audience members fear not. In between the film shoots, Angelos provides curious and often humorous anecdotes about the film’s history and reception. We learn about MGM’s brutal exploitation of the young Judy Garland, actor Margaret Hamilton’s accidental brush with fire, and other stories from the film’s disastrous production, which took four directors and hundreds of thousands of dollars over its budget to complete. We also consider Oz’s significance for LGBT viewers, and various political interpretations of the film, including the theory that it’s an allegory for American monetary policy. We’re also treated to some special guest appearances. First, there’s a cartoonishly dastardly Ayn Rand, who appears somewhat perplexingly to explain her philosophy of Objectivism, which emerged around the same as The Wizard of Oz. Then, more relevantly, we meet Salman Rushdie, whose reflections on the meaning of “home” in the Oz story are some of the show’s most poignant. Combine all these elements and the result is part Whose Line Is It Anyway? and part Ted Talk, one that’s frequently as funny as it is educational. And the actors clearly have a lot more fun making it than those who filmed The Wizard of Oz, many of whom barely survived the perilous endeavor. Among the performers, Heller stands out, with her excellent impression of the Wicked Witch of the West. For audiences struggling in the grips of the Great Depression in the late 1930s,The Wizard of Oz was a much-needed fantasy. Now, as the United States finds itself once again in uncertain times, Elements of Oz is, likewise, a welcome escape. That place over the rainbow where there “isn’t any trouble” may be ever elusive, but, as The Builders Association’s production attests, it’s still a destination worth dreaming.